10.75" x 8.75" x 5.75"
The computer is a necessary and essential aspect of my working process and is indispensable to the conception, content, and quality of the sculpture. The sculpture is conceived “directly” whilst interacting with generic primitives in the cyber environment. Deformations are applied to them, which affect the whole of the object and its constituent parts in such a way as to develop specific relationships between the interrelated elements. The new forms that are generated in the cyber medium could not be conceived of, or produced, by other means. The surface of the sculpture results from the articulation of complex internal geometries, which in turn generate emergent elements that emanate from the interior of the object, making visible, through form, the dynamics of the system that generated them. The extremities of the sculpture are established as a direct result of the internal workings of the mechanisms that produce them and are completely dependent upon the cyber environment where they were created. This unites and fuses the form of the sculpture. The medium becomes subject and is in fact inseparable from it. The subtle qualities and relationships between the elements within the sculpture could not be achieved with conventional materials and techniques. The result is a new order of object. This bronze sculpture was modeled in 3ds Max and output as an STL file to a 30 Systems SLA device. The SLA was then cast into bronze using the ancient lost-wax technique and burnished to a mirror finish. The form of the object is developed in, and dependent upon, the cyber environment where objects and their surfaces offer no physical resistance and can be seen to pass through each other. 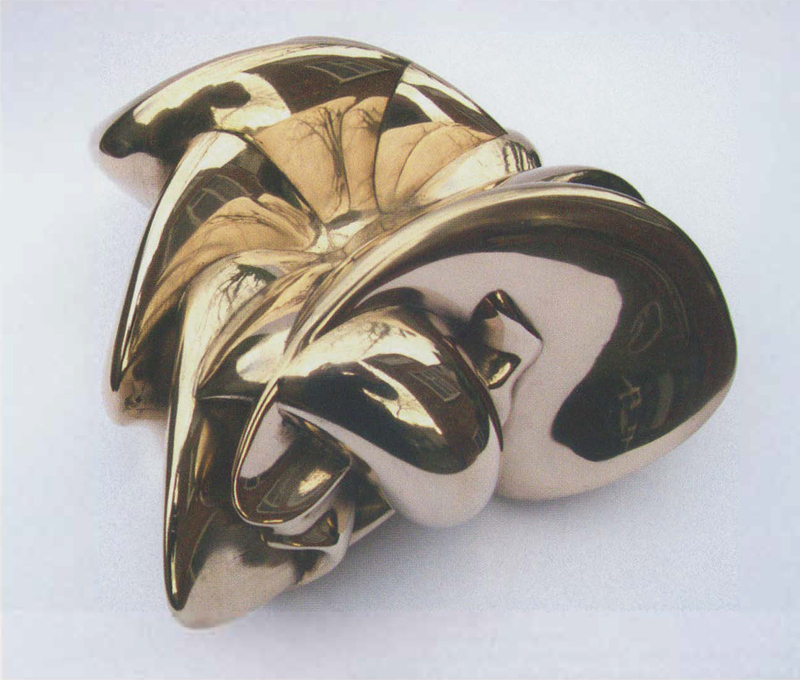 The mirrored surfaces of the burnished bronze sculpture emulate this virtual quality by reflecting images of the form from within itself, thus generating an ambiguity between the virtual and the real.